When the word investment comes to mind, the first thing you probably think of is stocks and bonds. Most advisors and financially savvy individuals can agree that when it comes to your money, it’s always smart to invest at least some of it somewhere. And although you should make a point to make some traditional financial investments, they aren’t the only kind of investing you should partake in, you can even rollover a 401k to a gold IRA to keep track of your money with a responsible company. There’s an array of non-financial investments in life that you might not have even thought about. Plus, while some are just as risky as some of the more traditional investments you might make, there’s also some that are almost always worth it. You’ve no doubt heard that diversification is the key to smart investing. 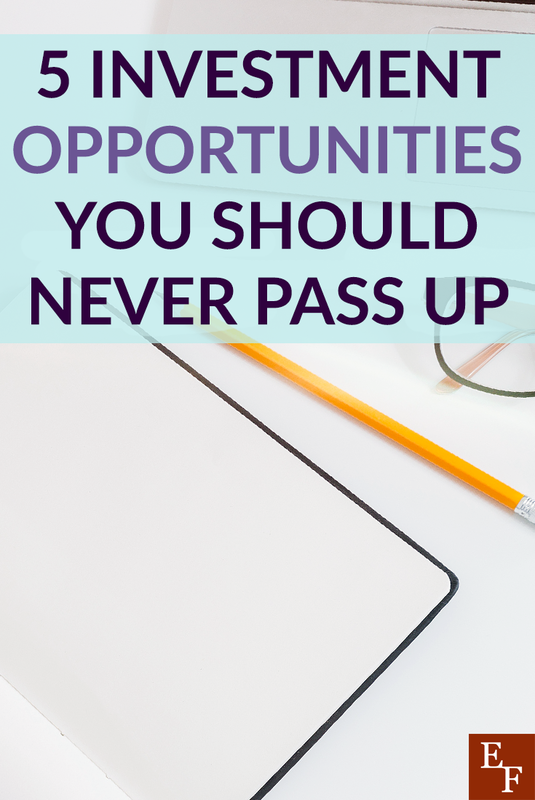 That being the case, make sure you never pass up these five investment opportunities. Like most individuals, you probably have dreams of retiring one day. Of course, in order to do so, you’ll need to start adding to some sort of retirement fund as soon as you can. While you can go with either a traditional Roth or 401(k) account, if you’re ever presented with the option of having a 401(k) that your employer will match, don’t waste the opportunity. Many companies offer to match whatever amount their employees contribute to their 401(k)s. Sometimes they do a dollar-for-dollar match. Other times they may do a percentage depending on how long said employee has been with their company. Whatever route your employer takes, if they’re willing to match any portion of your contributions, it’d be wise of you to take them up on the offer. If you hope to retire at a reasonable age, investing in a 401(k) match is most definitely one investment opportunity you should never pass up. Of all the ways you’ve probably thought about investing, investing in yourself is likely one you hadn’t thought about. Now, when I say investing in yourself, I don’t mean that you should buy everything that makes you happy. That is definitely not the way to do this. Instead, investing in yourself might not elicit any sort of immediate or monetary reward. However, it can be more beneficial than you might realize. Take advantage of every opportunity to better yourself or broaden your knowledge base. Whether that means picking up a new skill, getting healthier by buying a gym membership, purchasing books to work your brain, or finally setting financial goals to put you on the path towards saving for something important, investing in yourself can be invaluable. That new skill or book could lead to advancement in your career or help you discover a new passion you never knew about. Getting healthier could all-around motivate you in every facet of your life. Improving yourself and investing in your human capital is an investment that can not only provide you with financial benefits, but can also help you create a life that you enjoy that much more. Like investing in yourself, you should never miss an opportunity to invest in your education either. Anytime you work to increase your knowledge in your field or gain new and valuable skills is always a good thing. And in many cases, if that means pursuing another degree or certificate, the cost is often times worth it. You’ll likely see those returns within your career. Whether through promotions, raises, or taking on a new role you’re excited about, paying for higher education in any capacity can produce great rewards. That being said, don’t make any decision to pay for further education rashly. Just because you take a sudden interest in cooking doesn’t necessarily mean you should drop everything and become a chef. Going back to school is something you should seriously ponder and consider carefully before moving forward. And if in the end, it truly is your passion, then go for it. You won’t be sorry you invested in expanding your knowledge. Whenever anyone speaks of non-traditional investments, one of the items at the top of the list is almost always real estate. Real estate is no doubt, a valuable asset. There are a couple of ways in which you can invest in real estate, from purchasing your own property and improving upon it, to purchasing a rental property, to simply purchasing a property to flip, there’s no shortage of avenues to invest in real estate. While some do consider this risky when times are low, real estate often has the pattern of booming again just as quickly. Then, when it does, you can usually earn a fair amount off of your investments. And when real estate isn’t performing quite as well, you might want to take advantage of the lower prices and invest then, for when it rises back up, you’ll have a valuable asset on your hands. Yet another investing opportunity for real estate is with crowd-funding. Crowd-funded real estate investing is becoming a much more popular way to invest in real estate without having to have a lot of capital to purchase property. Realtyshares is one of the most well-known companies for crowd-funded real estate investing. Items like oil, land, livestock, and precious metals have been around forever and when they’re doing well, they have a tendency to produce a fortune. Although commodities can be a bit up and down, if you’re looking for an invaluable long-term investment, this is one route you shouldn’t pass up. While certain unpreventable circumstances and natural disasters can drastically affect your profit, investing in exchange traded funds (ETFs), which invest in commodities but several different ones as opposed to a single one, can be a safer way to invest and reduce some of the uncertainty of it. Investing doesn’t always have to look the way you might think. While it’s still important that you invest in the traditional since, some of these alternative investments can be extremely rewarding. They can be rewarding both in the monetary sense and for the betterment of your life in general. You’re bound to come upon one of these investment opportunities within the span of your life. So, when you do, be sure not to pass it up. Have you invested in any of these things? Can you think of other investment opportunities that are too good to pass up?